Saturday was another lazy afternoon - for Dave! I on the other hand been to yoga and played two hours of women's (two's) volleyball before lunch - then there was a coed doubles match planned for after lunch. No rest for the wicked, huh? What I did know is that I had about 30 minutes to get some lunch in the belly with an hour of digestion time before getting back to volleyball. I needed protein and carbs and the quickest way to get them both is in a sandwich. There is a theory out there that it is harder for your body to digest protein and carbs at the same time. The book called Fit for Life talks of this and I recently read an article about why office workers are often tired after lunch. In the article it claims the same sentiment toward the digesting of protein and carbs and recommends staying away from sandwiches, opting for salads at lunch instead. 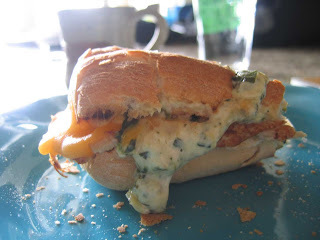 I clearly did not listen to this article today as I went right for a hot, melty turkey sandwich. Toast a French Roll under the broiler, there isn't any reason to slop on butter here - the extra fat isn't needed. If you happen to have guacamole in the fridge, spread this on the bottom of the roll (otherwise use just plain avocado.) 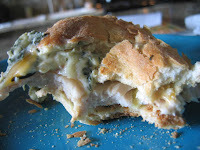 Layer on thin slices of turkey, then add artichoke spinach dip on top of the turkey. Place slices of a mild cheddar cheese on the open top portion of the roll and place back under the broiler. The roll should be open flat to melt the cheese, this will also warm the dip! Once the cheese is melty, simply press the two sides together and bite away! I have to admit I did not play nearly as well that afternoon...perhaps it was the sandwich or it could have been that I was spent from the morning activities. Either way, it was a great sandwich and I'll have it again.... maybe I'll have it after the sports activities next time though! Go ahead and play hard (rest hard for some of you!) but don't forget eat fun; and above all be fat and happy! This is a very good sandwich, I love the flavor combo. I made the mistake of using a sourdough sub-roll instead of bread. The roll was really hard after being toasted. I would stick with the wheat bread. We also toasted the turkey. Very good. Yummy!